The five pound gold coin is Britain's largest and most impressive gold coin, although there was previously a five guinea piece which was about 5% heavier. The designs generally follow that of the sovereign, so that the reverse usually features Benedetto Pistrucci's magnificent depiction of Saint George slaying the dragon. The gold five pounds, a five sovereign coin, was first struck in 1820 for George III, although it was not issued for circulation, being only a proof pattern coin. 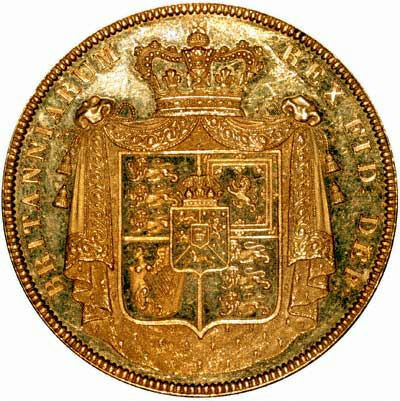 The modern sovereign had been re-introduced in 1817. A further proof-only version was produced in 1826 for George IV as part of the Coronation proof set, but again this was not intended for circulation. No five pound coins were issued for William IV, and the next date produced was 1839 for Victoria. This also was a proof-only version, not intended for circulation. All of the above coins are rare and expensive. In 1887, a larger quantity of five pound coins was produced on the occasion of Queen Victoria's Golden Jubilee. They were produced in proof editions, and for the first time, a normal circulation type version. Similarly in 1893, two versions of the five pound piece were produced to mark the change to the "Old Head" coin issues. In 1902 there was a coronation issue of coins which included another five pound coin, again in two versions. Only small numbers of five pound coins turn up which show much sign of having been used in circulation. These are all from the three issues of 1887, 1893, and 1902. It is evident from this that the five pound gold piece was never really much used, and certainly not in everyday transactions. Future issues were never used for circulation. George V's coronation in 1911 was marked by the issue of proof coins sets, some of which included a gold five pounds. For the coronation of George VI, proof coin sets were issued in 1937 including a five pounds. In advance of decimalisation in 1971, a department was created at the Royal Mint to produce, package and market coins for collectors, and in 1980, five pound gold coins were once again issued, and this production has continued in most years since. In many years both proof and ordinary versions have been produced, while in other years only one version has been made. The story of the gold five pound piece would not be complete without a mention of the "promotion" of the crown from a five shilling or twenty five new (decimal) pence value to a five pounds face value. Henry VIII issued the first British crown in 1544 as a gold coin with a value of five shillings. In 1551 under Edward VI, the crown was issued as a silver coin, again with a value of five shillings. Crowns continued to be issued, with some interruptions, until 1981. Throughout all this time, its value remained unchanged at five shillings, although after 1971, this became the decimal equivalent of twenty five new pence. With the issue of a crown to commemorate the Queen Mother's ninetieth birthday in 1990, the value of the new issue of crowns was changed to five pounds, presumably reflecting inflation. In that year, although the newly promoted crown was designated as a cupro-nickel coin, there were special silver and gold editions struck for sale to collectors. It could be considered then, that two traditions have been revived, not only has the crown been struck in gold for the first time since Edward VI in about 1553, but also five pound coins were struck in gold, reflecting their relatively recent heritage from 1820. 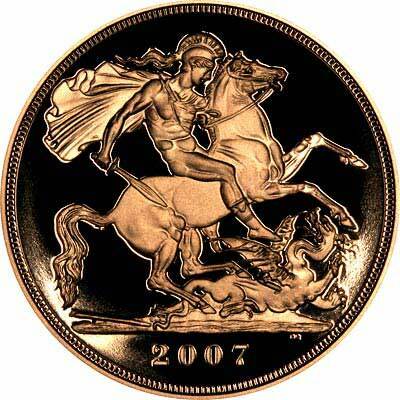 With the issue of the start of the commemorative gold crowns, there are now two types of five pound coins issued, the traditional Sovereign or St. George and Dragon design, and the gold version of the commemorative five pound crowns, at least in the years in which these have been issued. We have increasingly started to refer to the original gold five pounds as "quintuple sovereigns", and the latter type as "five pound gold crowns" to distinguish more clearly between the two types. 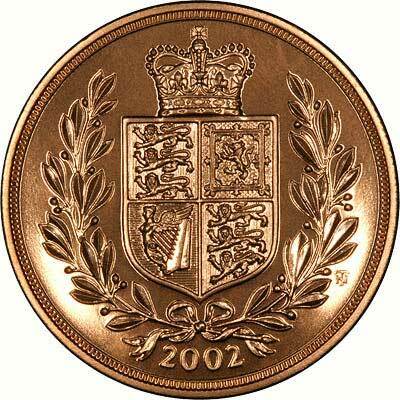 Any gold five pounds are a worthwhile addition to any collection of British coins. the increase in their design and production in recent years adds to the interest for many collectors. 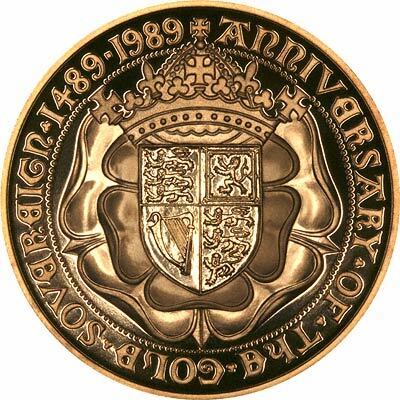 We believe the British Royal Mint distorted the English language when it started issuing "B.U. (Brilliant Uncirculated)" gold £5 (quintuple sovereign) coins in 1984, but this potential confusion did not come to light until 2000 when it issued not only a B.U. £5, but also a "bullion" version. These "Brilliant Uncirculated" gold five pound (quintuple sovereign) coins were struck to a superior but non-proof finish, and were issued in limited editions in boxes and with certificates, at a price over double their intrinsic gold content. When later in 2000 it then issued a "bullion" version of the same coin at only about 20% over gold, the error created some six years previously became exposed. This coin was brilliant (bright, shiny, and lustrous) and was also uncirculated (it had not been in circulation), although it was struck to a slightly lower production standard than the so-called "B.U." (Brilliant Uncirculated) version. When we expressed the opinion that people who had already bought the "B.U." version at £525 would be disappointed to find a brilliant uncirculated "bullion" version being issued at £325, a Mint official informed us that they were two different things, and that our criticism was quite incorrect. Perhaps the Mint should have added some extra description to its "Brilliant Uncirculated" products such as superior finish, specimen grade, monnaie-de-luxe, F.D.C., to differentiate these products clearly from those struck to a circulation grade of finish. It remains our firm opinion that the Royal Mint has created confusion in its careless use of the term B.U. or Brilliant Uncirculated. Diameter, Sovereign Type 36.02 mm. Diameter, Crown Type 38.61 mm.